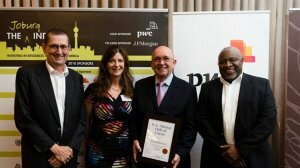 Dr Con Fauconnier was inducted into the Joburg Indaba’s South African Mining Hall of Fame, this week. Launched in 2016, the Joburg Indaba South Africa Mining Hall of Fame recognises and honours some of the individuals who, over many years, have significantly influenced the South African mining sector. After having experienced an initial hurdle, regarding what he wanted to study when he started university, Fauconnier approached Anglo American, where he managed to secure funding to complete his degree. “. . . I didn’t choose a career in mining, it actually chose me,” he enthused. Once he began working at Anglo American, at its Springfield Collieries, and established a relationship with coal mining that was to persist throughout, reaching its summit with the establishment of Exxaro Resources, Fauconnier moved through the ranks of JCI before joining Iscor Mining, where he became executive director in 2001. He was the lead executive at Kumba Resources from 2001 but, by 2006, an unbundling was proposed to help Anglo American meet its empowerment obligations. Kumba Resources’ coal and other assets were, subsequently, merged with that of Eyesizwe Coal to create Exxaro. After just over a year as CEO of Exxaro, Fauconnier made way for Sipho Nkosi, taking his place with the rest of the Exxaro pensioners, as he describes it, and in so doing, setting the groundwork for one of South Africa’s best black-owned mining companies. Fauconnier’s academic interests, meanwhile, have persisted. He produced academic papers that range from the cause and prevention of gas explosions to corporate governance in the technicalities and ethics of executive pay. Fauconnier joins 12 esteemed members in the South African Mining Hall of Fame. They include Phumzile Mlambo-Ngcuka, Bobby Godsell, Patrice Motsepe, Mark Bristow, Gwede Mantashe, Brian Gilbertson, Sipho Nkosi, Marius Kloppers, James Motlatsi, Ian Cockerill, May Hermanus and Barry Davison.